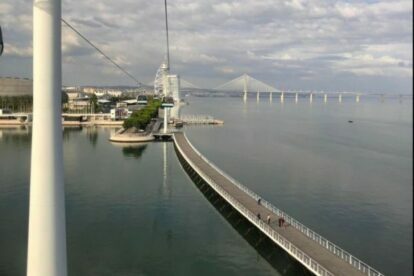 At Parque das Nações, just a metro ride away from the centre, Lisbon takes on a different look. This area was built for the Expo held here in 1998 and the architects took the opportunity to go a bit wild and use their modern ideas. I was at Expo 98, and during the years after, I became a frequent user of the wonders of this area. At first, when I was a child, it was the perfect playground, with plenty of space to cycle, run, play with the water jets. Years later, as an adult, it was still the perfect playground to enjoy a ride on the cable car, flying over the river, to cycle, read and go to the theatre. Parque das Nações slowly but surely developed into one of the most beautiful areas of Lisbon, not only for its access to the river, but also for all of its attractions. The oceanarium, the casino, the benches by the river. You name what you want to do, you do it. Including great food! Make sure you take that cable car trip. It’s stunning!